In the World Library of Psychologists series, international experts present career-long collections of what they judge to be their finest work—extracts from books, key articles, salient research findings and their major theoretical and practical contributions. 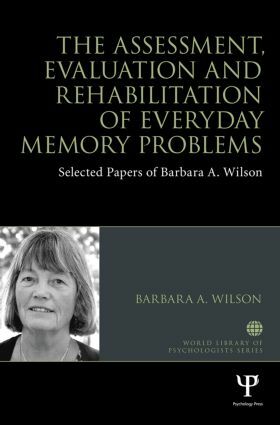 This volume of self-selected papers recognises Professor Barbara A. Wilson's major contribution to the study of neuropsychology. Published over a 25-year period, the papers included here address the assessment, treatment and evaluation of rehabilitation provided to people who have memory difficulties arising from an injury or illness affecting the brain. This selection of papers includes work on errorless learning, the natural history of the development of compensatory memory systems, paging systems developed to enhance independent daily living for memory impaired people and single-case experimental designs to appraise the response of individual patients. The final section includes a practical framework for understanding compensatory behaviour, a model of cognitive rehabilitation and a discussion of the dilemmas created by the different aims of neuroscience as opposed to those of clinicians. This book will be of great interest to clinical psychologists, neuropsychologists, occupational therapists and speech and language therapists, along with anyone who is interested in reducing the impact of memory problems on people who have suffered brain injury. Assessment. Baddeley & Wilson, Frontal amnesia and the dysexecutive syndrome. Wilson, Cockburn, Baddeley, & Hiorns, The development and validation of a test battery for detecting and monitoring everyday memory problems. Wilson, Baddeley, Shiel, & Patton, How does post traumatic amnesia differ from the amnesic syndrome and from chronic memory impairment. Treatment. Baddeley & Wilson, When implicit learning fails: Amnesia and the problem of error elimination. Wilson, Baddeley, Evans & Shiel, Errorless learning in the rehabilitation of memory impaired people. Wilson & Hughes, Coping with amnesia: The natural history of a compensatory memory system. Wilson, Emslie, Quirk & Evans, Reducing everyday memory and planning problems by means of a paging system: A randomised control crossover study. Page, Wilson, Shiel, Carter & Norris, What is the locus of the errorless-learning advantage? Saez, Deakins, Winson, Watson & Wilson, A ten-year follow up of a paging service for people with memory and planning problems within a healthcare system: how do recent users differ from the original users? Evaluation. Wilson, Single case experimental designs in neuropsychological rehabilitation. Wilson, Long term prognosis of patients with severe memory disorders. Theories, models and frameworks. Wilson & Watson, A practical framework for understanding compensatory behaviour in people with organic memory impairment. Wilson, Towards a comprehensive model of cognitive rehabilitation. Wilson, The clinical neuropsychologist’s dilemma. Barbara A. Wilson is a clinical neuropsychologist who has worked in brain injury rehabilitation for 35 years. She has won many awards for her work including an OBE in 1998 and two lifetime achievement awards. Her publications include 19 books, over 270 journal articles and chapters and eight neuropsychological tests. She is the editor and founder of the journal Neuropsychological Rehabilitation, and in 1996 she founded the Oliver Zangwill Centre for Neuropsychological Rehabilitation.